Pittsburgh branch of the NAACP asks Willson to speak out against lynching. 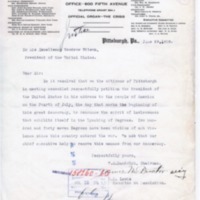 Be it resolved that we the citizens of Pittsburgh in meeting assembled respectfully petition the President of the United States in his address to the people of America on the Fourth of July, the day that marks the beginning of this great democracy, to denounce the spirit of lawlessness that exhibits itself in the lynching of Negroes. Two hundred and forty seven Negroes have been victims of mob violence since this country entered the war. We ask that our chief executive help to remove this menace from our democracy. Randolph, William M. , “William M. Randolph to Wilson,” 1918 June 29, TI00138, Race and Segregation Collection, Woodrow Wilson Presidential Library & Museum, Staunton, Virginia.